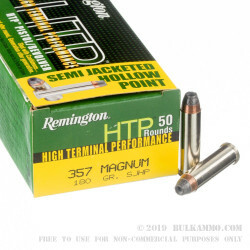 If you keep a wheel gun chambered in .357 Magnum for defense, then this 500-round case of ammunition from Remington is a smart choice for you. Remington is one the oldest, most venerable manufacturers in the United States and the only one to currently manufacture ammunition and firearms at a commercial level. 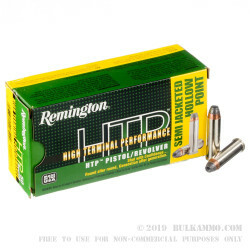 Their HTP, or High Terminal Performance loads are crafted to deliver excellent ballistics at an inexpensive price point. 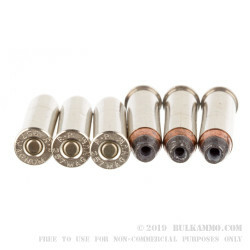 Each round sports a heavy, 180-grain SJHP projectile which features a hollow cavity carved into an exposed lead tip. This construction encourages massive expansion during entry into a game target or threat on your personal safety which creates a larger wound cavity while transferring greater energy to vital zones. As a result, these rounds yield quicker, more effective drops. 180 grains is heavy for the caliber but performs well when fired through long-barreled revolvers and lever-action rifles. The heavy weight translates to a longer body which grabs more rifling and improves accuracy out to a distance. 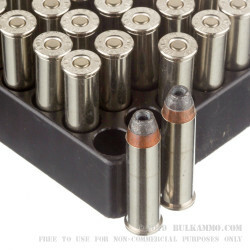 Each bullet is crimped into a reloadable brass casing which is equipped with a clean-igniting Boxer primer. This 500-round case gives you plenty of ammo for periodic practice that reflects the exact ammunition that you intend to carry into the woods or have at the ready inside your nightstand.